This is not really a new application, but I wanted to share it and give you a quick review. 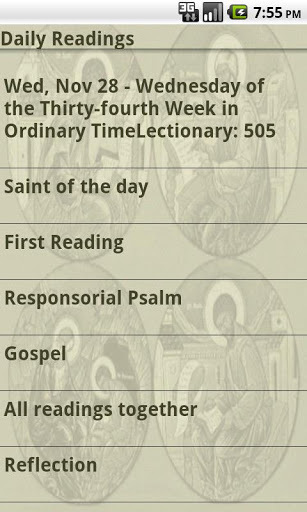 Before I found this app, I had a half dozen other apps on my iPod that did various different things including gave me all the common prayers, readings for the day, the Catechism, and reflections from various sources on the gospel readings. This App bring them all together into one place. This is even more so the case now. They have added a lot of new prayers, and other helpful things. One of my new favorites has been the Latin prayers and the Search for prayers. That was is really useful if only know a few words of the prayer and don’t know the name. The other new feature is the ability to bookmark. 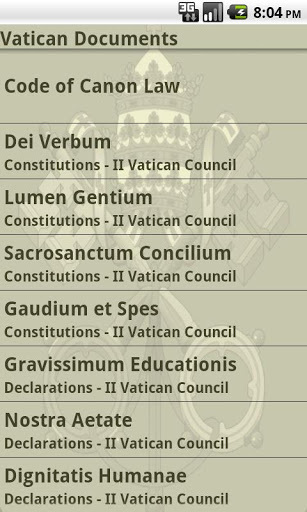 (I think this is new, or maybe It is just that I didn’t know about it before) this is invaluable when you are working with some of the longer works like, the three versions of the bible that are included, the Catechism or the Code of Cannon Law. 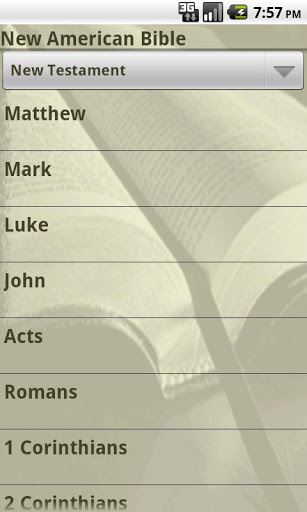 It is a great little app that I use more and more as I get into it. It seems to have just about everything that I need as far as resources on the go. The prayers, the readings, the reflections, as well as things like a guide for confession and a full copy of the New American Bible are in there. since I originally wrote this post, they have fixed the one problem that I had with it. The close button for the prayers was way up high next to the start over button for the Rosary. 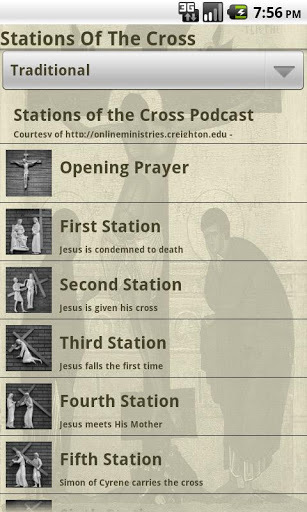 They have moved it down and made it bigger, so you can easily hit it while praying, and don’t have to stop praying to move to the next prayer. If there is one thing that I rather dislike about the app, and a reason that I would give it less that 5 stars, it is the rosary feature. When I found that this has a virtual rosary I was pretty excited. I am terrible about carrying a rosary with me. I almost always have a lot in my pockets and with a Rosary in there it tends to get destroyed (which I always feel really bad about,) or it will get tangled up in everything else in my pocket. 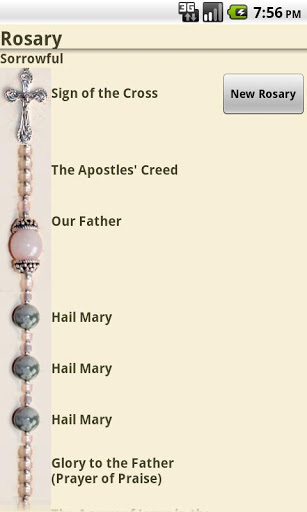 The Rosary feature, (as shown below) shows you a picture of the rosary and each bead changes color as you click on it. When you click on the beads, the screen changes and shows you the prayer. That is all well and good but to get back to the screen with the beads you have to click the little X. 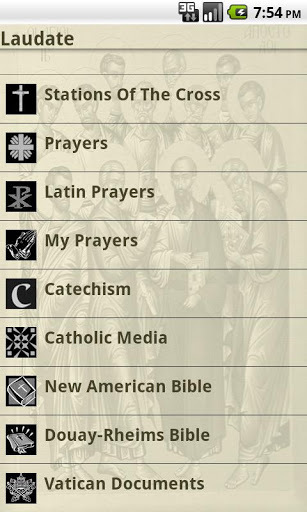 The problem is that the little X and restart Rosary button are so close that very frequently I have clicked on the wrong one in the middle and had to find my way back to where I was to continue. It is annoying enough that I don’t use that feature unless I really have to. If I forget the words to one of the prayers withing the Rosary I go to the prayers section and look it up and just count the Rosary on my fingers. But I have to say this is about the only feature that I don’t like. I will say this again, I am really happy with this app. It is free app but I would honestly be willing to pay for it. (Which considering hoe cheap I am normally, that is saying a lot.) The App is not prefect but it is pretty incredible. I really like having all my resources in one place and being able to get to things quickly, Laudate certainly fits the bill for that. As these screen shots show everything you need is on one easy to use menu. The sub menus and small apps within are easy to follow and allow you easy access to the resources.